To Dagrun on the "Ships starting with D" page. From N-Goran Jonsson Sweden collection (Potographer unknown). Built by Kockums Mekaniska Verksteds A/B, Malmö, Sweden in 1928. In service for The Ministry of War Transport from May-1940. Captains: E. G. Johansen (from Apr. 9-1940). When he became ill, Peter O. Petersen took over in New York on June 1-1941, followed by A. Amundsen who came on board in New York on May 1-1942. Errors may exist, and some voyages are missing. See also my narrative further down on this page. Aug. 29 Methil   OA 206 For Sydney, C.B. Sept. 30 Sydney, C.B. Clyde Oct. 14 HX 77 Convoy will be added. Dec. 10 Liverpool   OB 257 Dispersed Dec. 13. Febr. 9 Clyde   OB 284 For Halifax. Apr. 6 Milford Haven   OB 307 For New York City. Aug. 11 Clyde   ON 6 For Philadelphia. Nov. 7 Liverpool Freetown Nov. 28 OS 11 For Capetown. Febr. 21 Freetown Liverpool March 16 SL 101 99 Mails. Dec. 6 New York City Gitmo Dec. 13 NG 327 For Cristobal. 1943 Febr. 6 Capetown   CA 10 Dispersed Febr. 8. March 24 Alexandria Port Said March 25 Independent To Suez March 26. June 13 Freetown   SL 131 Rendezvoused w/MKS 15 June 24. July 24 Liverpool Halifax Aug. 5 ON 194 For St. John, N.B. Nov. 18 Oban   ONS 23 For Tampa. * The above voyage seems out of place, and I believe it should be deleted. According to Page 4, she arrived Guantanamo Bay on May 8-1944. Possibly joining UGS 46 for this passage. July 7 St Michaels   OS 82/KMS 56 For Alexandria. July 11 Convoy split   KMS 56 Convoy will be added. July 13 Passed Gibraltar Port Said July 23 KMS 56 For Alexandria. Aug. 18 Casablanca   SL 167 Rendezvoused w/MKS 58 Aug. 19. Sept. 23 Aberdeen Loch Ewe   Convoy unknown. Sept. 29 Loch Ewe Loch Ewe Sept. 29 ONS 33 Put back with defects. Oct. 14 Loch Ewe   ONS 34 For Sydney, C.B. 1945 March 22 Liverpool   ONS 45 For New York City. Some of the dates in this report do not match up with A. Hague's Voyage Record and the archive document. Source for the report is given at the end of this page - I've chosen to leave the dates "as is". When Norway was invaded on Apr. 9-1940, Dagrun was on a voyage from Durban to Baltimore with ore, arriving Apr. 11 (see also Page 1 of the archive documents). Captain at this time was E. G. Johansen. After having unloaded her cargo she had to wait until Apr. 26 before receiving new orders, first for Norfolk for coal with departure Apr. 29 for Buenos Aires where the cargo was discharged. Taken over by Ministry of War Transport (time charter) then departed Buenos Aires on May 29 for Bahia Blanca, arriving June 2. With a cargo of grain she now headed to Freetown, then on to Belfast for the installation of degaussing (together with Thalatta, she's listed in Convoy SL 38, which departed Freetown on July 1-1940 and arrived Liverpool on the 20th - Dagrun stopped at Belfast Lough that day. See the external website that I've linked to in the table above - this convoy will also be added to my own website). She subsequently continued to Clyde to join a convoy which departed on July 31 (I'm assuming the captain is referring to Convoy WN 4, which left Clyde on Aug. 1, and in which Sofie Bakke was lost following a collison). The captain says the convoy was attacked by aircraft on Aug. 3, but though bombs fell quite close and a ship in front of her was hit and set on fire (possibly British Statira? ), Dagrun was unharmed. However, she collided with a small vessel when the latter had to perform evasive maneuvers in order to steer clear of the bombed vessel, but received only minor damages and could continue her voyage. Jan-Olof, Sweden has told me that this was the Swedish Johanna, which is also listed in Convoy WN 4 (Captain Axel Winberg) and the location was 20' WSW Cape Wrath. He has sent me a copy of a report in which the captains of the 2 ships blame each other, the captain of Johanna saying that the indirect cause of the collision was the air attack which caused confusion in the convoy, but the direct cause was Dagrun's attempt to get out of the convoy. The Swedish captain says he believed Dagrun had originally had station 26, and had sailed on Johanna's starboard side, but had passed the Swedish ship after the aircraft attack and disappeared out of sight in the dark for a while, then appeared again on her starboard side, striking Johanna in her starboard bow with great force, causing serious damages. However, Johanna was also able to continue and was later repaired in Grangemouth where she arrived on Aug. 8 (demanded 4000 pounds in security from Dagrun's company). Dagrun was accused of "not keeping lookout, not keeping her station in the convoy, of having changed her course towards Johanna, of not having stopped or backed up, of having broken the rules for behaviour at sea and of "bad station keeping", while Dagrun accused Johanna of the same things, adding that Johanna had gone to starboard without signalling. Dagrun's side of the story says she was on a voyage from Bahia Blanca for Hull with 7420 tons of wheat and frozen meat (again, see Page 1 and Voyage Record above), and was about 10 miles off the coast of The Minch between Ru Stoer(?) and Cape Wrath when the collision occured shortly after 01:00 on Aug. 3. Johanna was No. 8 in the same column as Dagrun, which would mean Johanna was sailing behind her (if the Swedish captain's statement saying Dagrun was in station 26 is correct), but the Swedish ship was way out of her position, being 2 ship lengths away from Dagrun's port beam when the aircraft attack occurred. According to this report it was Dagrun who had to steer clear of a burning ship in front of her, then shortly afterwards Johanna's starboard bow hit her port bow. The report adds that Dagrun was on British time charter from May 20 until Aug. 19-1940. As mentioned, the owners of Johanna claimed damages from the owners of Dagrun, while the owners of Dagrun counterclaimed against the owners of the Swedish ship, but a judge put an end to this dispute when he delivered his judgement in May-1941 that neither vessel was to blame for the collision. "He held there was no negligence on either side and he dismissed both claim and counterclaim, making no order as to costs" (from a newspaper clipping dated May 7-1941, also received from Jan-Olof). After the collision, Dagrun arrived Hull on Aug. 6 where her cargo was unloaded, whereupon she went to dry dock. At the same time she received a 4" gun and a machine gun. She departed Hull on Aug. 25 and arrived Montreal, via Sydney, C.B., on Sept. 13. She had started out from the U.K. in Convoy OA 206, which left Methil on Aug. 29 and dispersed on Sept. 2, Dagrun stopping at Sydney, C.B. on Sept 10 before continuing to Montreal that same day. Libra is also listed (to Clyde only), while Victo was scheduled but did not sail - again, see the link in the table above. A cargo of iron and lumber was loaded before departing Montreal again on Sept. 26 for the U.K., via Sydney, C.B. for convoy, departing Sydney on Oct. 1. After the convoy had been attacked on Oct. 11 and several ships sunk (this was HX 77* in which Davanger and Brandanger were sunk - follow the links for details), it was dispersed, and Dagrun continued alone until Oct. 13 at which time a torpedo from U-138 (Lüth) barely missed her and detonated about 30-50 meters from the side of the ship. This took place between the northern point of Ireland and the Hebrides. The gunners fired back with the 4" gun. During the next hour they saw a periscope several times, but nothing further happened. After Dagrun had sent out a radio signal at 14:39 about being attacked, the destroyer Witherington proceeded at full speed to her position, while at the same time the destroyer Weston was also sent to investigate. At 17:50, HMS Shikari established contact with Dagrun, which reported that a torpedo had detonated close by and that the U-boat had last been seen at 15:30. With regard to Dagrun on this date J. Rohwer says that the name Dagrun was quoted by the xB-Dienst (U-138), but that there's no report of damage by enemy action in allied documents. Dagrun was now escorted by a destroyer until they reached the coast of England, then continued to Manchester where they arrived Oct. 25. Again, see Page 1 of the documents received from the National Archives of Norway. * According to Arnold Hague, this convoy originated in Halifax on Sept. 30-1940 with 39 ships, arriving Liverpool Oct. 15. He lists 6 ships lost, namely Pacific Ranger (no casualties), Port Gisborne (26 dead), St. Malo (28 dead) and Stangrant (9 dead) in addition to the 2 Norwegian ones. Other Norwegian ships, in addition to Brandanger and Davanger already mentioned, were Emma Bakke, Heina and Samnanger. HX 77 will be added to an individual page in my Convoys section, but for now, please see ships in all HX convoys. Unloading of cargo in Manchester was completed on Dec. 5, whereupon Dagrun went to St. John, N. B., with arrival Dec. 28. She is, in fact, listed in Convoy OB 257, which left Liverpool on Dec. 10 and dispersed on the 13th - ref. external link provided in the table above for the names of other ships in this convoy. A Hague has also included the Norwegian Storaas, Titanian and Topdalsfjord, while another section of the same site has also added Suderholm (but not Storaas), and says that Erviken, Hørda and Taranger were scheduled, but did not sail. According to Page 1, Dagrun had stopped at Halifax before proceeding to St. John. (Again, please note that some of the dates in this report do not match up with the archive documents and A. Hague's Voyage Record). Follow the convoy links provided for more details on them, several Norwegian ships took part. Having loaded a cargo of wheat at St. John, Dagrun left on Jan. 1-1941 for the U.K. via Halifax for convoy. She was scheduled for Convoy HX 101 from Halifax on Jan. 5, but instead joined the next convoy on Jan. 11, HX 102. She arrived Clyde on Jan. 30 (according to the captain - see also Page 1), unloaded her cargo in Glasgow, Scotland, departing again for St. John, N.B. on Febr. 9 (Convoy OB 284, which dispersed Febr. 14 and also included Acasta [did not sail? ], Borgholm and Sildra - ref external link within the table above). Via Halifax, she arrived St. John on Febr. 23 for another cargo of wheat, left Febr. 28 for Avonmouth, via Halifax. She was cancelled from Convoy HX 112 from Halifax March 1, in which Beduin and Ferm were sunk, but joined HX 113 on March 5. The captain says she arrived Avonmouth on March 22 (compare w/Page 2). Cargo was unloaded and 1000 tons ballast taken on, before she left for New York on Apr. 5 with independent arrival Apr. 24, having started out from the U.K. in Convoy OB 307, which had been dispersed on Apr. 13; Brønnøy, Chr. Th. Boe, Drammensfjord, Petter and Thorshavet are also listed. Dagrun subsequently went into dry dock for various repairs. Captain Peter O. Petersen now took over command (from June 1-1941). On June 6, she left New York for La Romana, Haiti to pick up raw sugar for the U.K., via Bermuda and Halifax, arriving Greenock on July 27-1941. She had initially been scheduled for the Bermuda section of Convoy HX 136 on June 28, but did not sail. She had also been cancelled from the Bermuda portion of the next convoy on July 4, HX 137, but finally got away with Convoy HX 138 from Halifax on July 11 (as can be seen when going back to the archive document, she had sailed from Bermuda to Halifax on July 7). Her next voyage took her to Philiadelphia (having sailed in the westbound North Atlantic Convoy ON 6, which originated in Liverpool on Aug. 11-1941), where iron was loaded, before proceeding to Norfolk to pick up more iron. She's said to have departed Norfolk on Aug. 15, again for the U.K., but this date must be an error - I believe the month should be September; Page 2, however, gives departure Hampton Roads (for Halifax) as the 17th of that month, having arrived there on the 15th. She's now listed among the ships leaving Halifax in Convoy HX 151 on Sept. 22 (station 54) along with the Norwegian Sama (85), San Andres (105), Meline (43), Morgenen (93), Belinda, Thorshøvdi (53), Sophocles, Tigre (44), Hardanger (94), Leiv Eiriksson (24) and Laurits Swenson. Dagrun arrived Manchester on Oct. 8 (via Liverpool Oct. 6, and Eastham Oct. 7). After her cargo had been unloaded she took on board a general cargo at Birkenhead for Dar Es Salaam and Mombasa, via Freetown and Cape Town, having sailed from the U.K. in Convoy OS 11, which departed Liverpool on Nov. 7-1941 and arrived Freetown on the 28th. This convoy also included Danio, Elg, Fana and Tigre - see the external link in the table above. New cargo was loaded at Mombasa, Dar Es Salaam and Beira, departing the latter on Jan. 23-1942 for Manchester with arrival there on March 18, via Cape Town, Freetown, Liverpool and Eastham - see Page 2. She had arrived the U.K. from Freetown in Convoy SL 101, together with Drammensfjord, Elin K, Tabor and Tanafjord - again, see the external link provided - Dagrun's cargo is given as copper and sisal, also carrying 99 mails. Having unloaded her cargo she had to go into dry dock again, then headed to New York on Apr. 10, arriving there independently on the 24th*, having sailed from the U.K. in Convoy ON 85*, together with Harpefjell (returned), Idefjord, Skiensfjord and Troubadour. From New York she went on another, longer voyage, namely with ammunition and general to Suez - her voyages in this period are shown on Page 3. At this time Captain A. Amundsen had command (from May 1). Departure New York had taken place on May 21. A few days later, on May 26, Dagrun rescued 17 survivors from the British M/T Darina (near Bermuda), which had been torpedoed by U-158 a week earlier, and landed them at Cape Town on June 23 - the external website that I've linked to at the end of this page has more on this attack. (The Norwegian Norland was sunk from the same convoy, namely ON 93*). 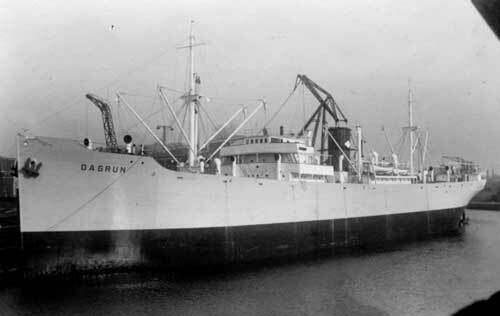 Dagrun continued her voyage to Suez, then on to Safaga in The Red Sea where a cargo of phosphates was loaded for Durban, from there she sailed to Georgetown and took on board a cargo of bauxite for New York, with arrival Nov. 19?-1942 (A. Hague gives arrival date as Nov. 10, agreeing with the archive document - convoy information can be found in the Voyage Record above). Captain Amundsen now had to take a leave of absence due to illness, and I'm not sure who took over meanwhile. Again war stores and landing barges (for Sicily) were loaded in New York, and this time she unloaded them at Alexandria, having travelled around Cape Horn. Chief Engineer Haldor A. Pedersen, who came on board in 1928 and was still there. 2nd Engineer Asbjørn Karlsen, who came on board in 1937. Mate Adolf Berg, who had been on board since 1936, became 1st Mate in Nov.-1940 when 1st Mate K. Leif Johnsen paid off in Manchester. 2nd Mate John T. Knudsen had been on board since 1938. Boatswain John Stensvik, since 1939. Steward Thomas A. Nilsen, since 1937. Cook Harry Alexandersen had been on board since 1939. By the time she arrived Alexandria, it was March-1943 (Page 3). She continued to Mauritius where a somewhat more peaceful cargo was taken on board, namely sugar for the U.K., where she arrived with Convoy SL 131/MKS 15, ref. external link in the table above for details on the combined convoy. The Norwegian Anna Odland, Hallfried, Karmt and Norheim also took part in this convoy, the SL portion of which had departed Freetown on June 13, joined up with the MKS portion from Gibraltar on June 24, the combined convoy arriving Liverpool on July 4. Dagrun's cargo is given as sugar and mail, voyage Mauritius to Mersey, which fits in with the statements in the report. She also carried 3 passengers on this voyage. She now headed back across the North Atlantic in ballast, having joined Convoy ON 194*, which left Liverpool on July 24 and also included Anna Odland, Belinda, Brimanger, Fernmoor, G. C. Brøvig, Germa, Heimvard, Kaia Knudsen, Lista, Morgenen, Noreg, Norheim and Skandinavia, while Acanthus, Potentilla and Rose are named among the escorts (see ON convoy escorts). A. Amundsen now came back on board in St. John, N.B., where she had arrived from Halifax on Aug. 12, and Dagrun proceeded to load iron and lumber for Hull, with arrival there on Oct. 16, having crossed the ocean with Convoy SC 143, which had left Halifax on Sept. 28 (the report gives arrival Hull as Sept. 12, but this must be an error - see also Page 4), unloading until Nov. 6, later returning in ballast with the westbound Convoy ONS 23*, via New York to Tampa, Florida. This convoy had originated in Liverpool on Nov. 17 and also had the Norwegian Grey County in its ranks, though this ship returned to port. In Tampa, where she had arrived on Dec. 15, a cargo of phosphates was loaded for Melbourne, Australia, departing Tampa on Jan. 3-1944 (the report says Jan. 1) with arrival Melbourne Febr. 25 - see convoy information in the Voyage Record above. From Australia she later proceeded to Taltal, Chile to pick up salpeter for Suez, from there on Aug. 2 to Casablanca Aug. 14. Note that several voyages are missing in this account; again see Page 4 as well as the Voyage Record for voyages made in between. Among these is a voyage from St. Michaels on July 7-1944, Convoy OS 82/KMS 56 (originated in Liverpool July 1; Dagrun joined July 9 and was not present from Liverpool). Destination is given as Alexandria; arrival there is not given, but she arrived Port Said on July 23 in KMS 56*, the convoy having split up on July 11. Arosa and Topdalsfjord are also listed. Dagrun proceeded to Suez that same day (July 23), arriving July 24, then left again on Aug. 2 as already mentioned, arriving Casablanca on Aug. 14, via Port Said (Aug. 3). For this voyage, she's listed in Convoy GUS 48, which departed Port Said on Aug. 3. She now loaded phosphates again, this time for Aberdeen. She left Casablanca on Aug. 18, joining Convoy SL 167, which had started out in Freetown on Aug. 9. This convoy joined up with MKS 58* from Gibraltar on the 19th, the combined convoy arriving Liverpool Aug. 29; Astrid and Boreas are also named. Dagrun stopped at Loch Ewe on Aug. 30, and later arrived Aberdeen on Sept. 10. The following month she headed back to the U.S. to pick up more lumber and iron for the U.K. With Cetus, Chr. Th. Boe, Drammensfjord, Mui Hock, Para, Peik, Rena, Romulus and Titanian, she had initially started out in the westbound Convoy ONS 33* at the end of Sept., but returned to port with defects, later joining the next convoy, ONS 34* a couple of weeks later (convoy originated in Liverpool Oct. 14). Danio and Lago also took part. At the beginning of Dec.-1944 we find her in the slow Halifax-U.K. Convoy SC 162, arriving Manchester on Dec. 20, via Liverpool and Eastham. See Page 5. After having unloaded her cargo of steel and lumber she went to a yard for misc. work, and did not leave again until March 20-1945. She subsequently joined the westbound Convoy ONS 45*, which left Liverpool on March 22 and included Norse Lady, Peik and Vera. This time, Dagrun's destination was Williams Head, British Columbia (via New York) for further orders, arriving May 12, with the knowledge that Europe was again at peace. On VE Day they had been off San Pedro, Calfornia. But daily routines still had to be carried on and she proceeded from Williams Head to New Westminster to pick up a cargo, arriving May 16 (? compare w/Page 5), then loaded cargo at Port Alberni and Vancouver Island, before returning to Liverpool, with arrival July 6. Departed for Buenos Aires on July 24, then took on board wheat, coffee and general at various Brazilian ports. It's hard to imagine what the atmosphere must have been like on board, because this time the cargo was meant for Oslo, Norway! She arrived there on Oct. 9, and by this time Japan had also capitulated so the world was truly at peace. Coming home after so many years of sailing in dangerous waters, and of desperate longing and concern for their country and family, must have been quite an experience. * The ON and ONS convoys mentioned here are available and will be added to individual pages in my Convoys section in due course, along with further details on each. In the meantime, the ships sailing in them (and escorts) are named in the section listing ships in all ON convoys and ships in all ONS convoys. All the KMS and MKS convoys will also be added; for now, see ships in all KMS convoys and ships in all MKS convoys. Sold in 1950 to Unterweser Reederei GmbH, Bremen, renamed Griesheim. Arrived Hamburg on June 8-1966 for breaking up. Back to Dagrun on the "Ships starting with D" page. The text on this page was compiled with the help of: "Nortraships flåte", J. R. Hegland, "The Allied Convoy System", Arnold Hague, "19 Oslo-skips historie under verdenskrigen, fra April 1940 til krigens slutt i 1945" ("The Story of 19 Oslo ships during the World War, from April 1940 until the End of the War in 1945") Harald Nicolaisen - based on the ship's logs and diaries, as well as the captain's and 1st mate's reports - ref. My sources.